Protects your purifier from sudden voltage fluctuation as high as 280 volts and also works in as low as 100 VAC. Height: 297 mm Width: 199 mm Depth: 435 mm Weight: 7.3 kgs Purified water flow rate[Average]*: Approximately 10 - 12 Litre per hour Water storage capacity: 10 Litres** 6 Stage purifying technology: Pre-Sediment Filter, Pre-RO Carbon Filter, Mini Filter,Reverse Osmosis Membrane, Micro Filtration Membrane/UV and Post-RO Carbon Filter Membrane type: Thin film composite spiral wound Pump Type: Diaphragm pump, 24V DC % Recovery*: Typically 25% TDS Reduction: 90% (Min) Power Rating: 55 Watts Pressure rating: 10-30 PSI**** Input Voltage: 165 - 240 VAC 50 Hz Material of construction: Food grade, non-toxic, engineering grade plastics Length of Power Adapter: 1.5 metres Total Dissolved Solids: Upto 1800 mg/lit Total Hardness: 500 mg/lit (max) Iron: 0.3 mg/lit (max) Turbidity: 1 NTU (Max) Germkill KitTM Purification capacity: Germkill Kit-1 has been designed to give approximately 4000L^ of purified water depending on the input water pressure, TDS and water temperature Purification capacity (CSF Germkill KitTM): Removes dissolved salts, hardness, pesticides and heavy metals like arsenic, lead and mercury. It also removes microbial contaminants like bacteria, virus, protozoa and cysts. Germkill performance standard: Meets stringent international criteria for microbiologically safe drinking water - e.g., Environmental Protection Agency (EPA), USA *Depends on your water quality. 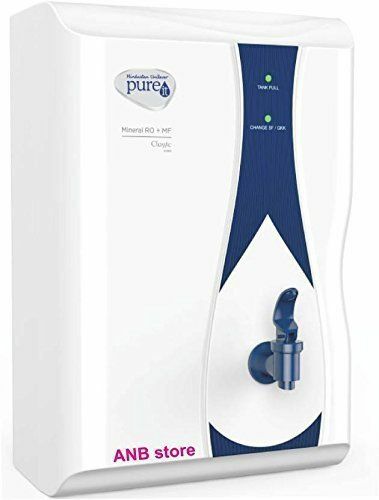 ^Pure refers to TDS range of water.10 litres only with running water. Or else 9.2 litres of water dispensing. #Total Dissolved Solids (TDS) is the purity measured. Purity Indicator shows the approximate range of TDS in water. The input TDS IN level is derived through a reverse percentage calculation from the TDS OUT level measured through the sensor, based on 90% TDS removal rate of RO membrane. Adds minerals post purification to enhance the taste of water, Removes 1 crore virus in 1 litre of water.